Module consists of four constant rate filters with individual feed pumps, and five chemical pumps. Module can be fed from two different raw water supplies. Each filter operates using automatic PID flow control. The module can be operated as four independent filters, or two sets of two filters in series (columns 1 and 2, feed columns 3 and 4). The air scour and backwash systems are shared by all filters, and also utilize automatic PID flow control. Chemical feed pumps are flow paced with direct entry of chemical dosage. Each chemical pump can be selectively paced to any of the filter feed flows, the combined filter feed flow, or the backwash flow. 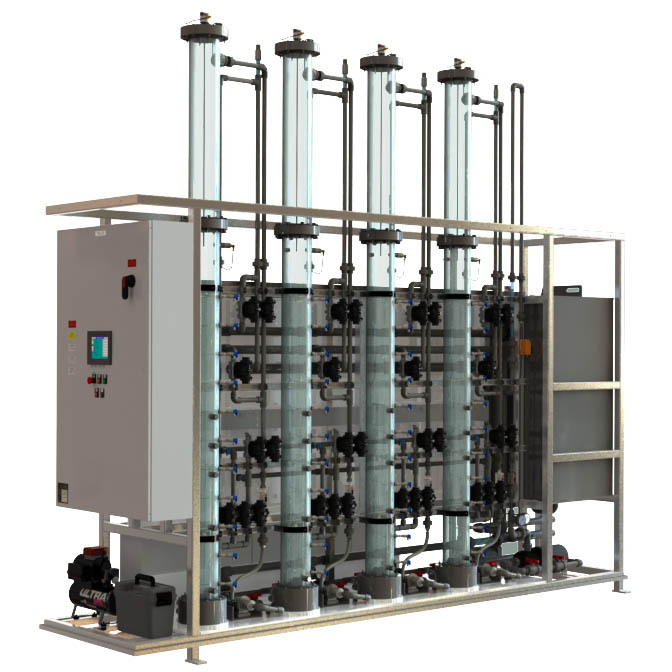 An improved backwash process is included, providing superior performance when operating biological filtration processes. Backwashing is initiated manually by an operator in the manual mode, or on runtime, run volume, headloss, or effluent turbidity in the automatic mode. Only one filter may be backwashed at a time. Other features include automatic data logging of key parameters, secure remote monitoring and control over the internet, and email alarm notification.